That would seem to be the former Ambassador's rule, having just ranted about the lack of federal recognition for the site of "the last battle between French and English", or Placentia. That would be the Battle of Signal Hill, Bill. And the three National Historic Designations in Placentia. So while Bill Rowe rails about what he calls the "sad neglect by the federal government of many of the historical aspects of Newfoundland and Labrador", he seems to be blissfully unaware, or wilfully blind to, some important facts. First, there are 94 National Historic Designations in the province, about 5% of the total — larger than the provincial share of the Canadian population or landmass. Second, the province has nine of the 158 federally-administer National Historic Sites. And finally, if that amount isn't commensurate with the province's share of Canadian history, then the remedy is easy: start nominating more sites, persons, and events to commemmorate. You see, Bill, this is the really wacky part: the National Historic Designations process is driven by nominations. The federal government doesn't dole them out of its own mere motion, or on some patronage basis. If you think something is worth federal historical recognition, Bill, anyone, nominate it. Here's how. PS, Bill — as for L'anse aux Meadows, it is one of two UNESCO World Heritage Sites in Newfoundland and Labrador, one of fourteen in Canada. Two is two more than PEI, NB, MB, or SK, and one more than NS or ON have. Sites are nominated at UNESCO by... that nefarious federal government you rail against. Other recent nominations have included Red Bay, Labrador. An editing error resulted in an incorrect headline - "Being a Tory not popular, according to Williams" - appearing on page A4 of The Telegram Feb. 27. The story was about federal/provincial relations. , and his comments were about the federal Conservatives - not the provincial Progressive Conservatives. I don't think the Harper government, the Conservative government, is good for this country. The quicker we can get rid of him, the better. Was a headline over such statements, especially the first-quoted, that erroneous at all? That's pretty much what he said; slightly paraphrased, but not outside the realm of Newspaper Headlinese. Yet, the same Terminology Police who objected to the "Being a Tory not popular" headline, especially since it might possibly be construed, during a polling period no less, that Tories Provincial are not popular, either have not yet objected to the innacurate use of the word "donation", or the paper hasn't yet run it. This, even though a previous, and, not co-incidentally, pre-election, misuse of the word "donation" got corrected, sorta, within two issues of the organ it appeared in. Ed Hollett is wrong, wrong, wrong. The reports - more than one - on all acute care facilities in St. John's, including the province's major health centre, were released later in the day. They chronicle $135 million in capital costs to address critical and potentially critical problems with the physical plant as well as a range of other problems and issues. They were prepared in 2005 but kept secret until Wednesday. We all know how the Premier feels about people who lie and don’t keep their political promises, and that the Premier always tells the truth and is never inconsistent or hypocritical, and that, therefore, he must have released those government-commissioned reports on the hospital situation in St. John’s within 30 days of their receipt, and indicated the action government would take within 60 days. Premier Williams runs an open and accountable government. 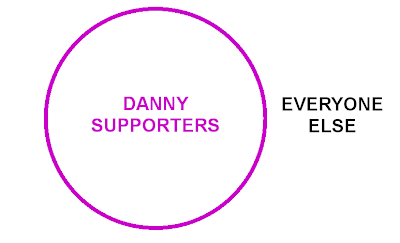 Danny is right. Danny is always right. And that, by definition, means that Ed Hollett must be wrong. Woah - this is serious! — Headline and sub-head on today's report by Rob Antle in the Telegram about the Auditor-General Gihad. Our Dear Feud is proving to be a regular goldmine of malaprop. Well I was there, and I’m saying it happened, my officials are there, and they’re saying it happened. I actually left that meeting, and shortly afterwards actually conveyed that message to my cabinet. In other words, if you don’t believe Danny, ask Danny instead! Proud of himself! Strong and determined, too, no doubt. But the ministers have clearly been put in their place: they are the deputies. He’s prepared to distort the truth and, if that is any indication of the measure of the person, then he is not good for this country. Distorting the truth is bad. A person who doesn’t tell the truth, if that is any indication of their measure, is not good. The Honourable Danny Williams, Premier of Newfoundland and Labrador, was joined by the Minister of Health and Community Services, the Honourable Ross Wiseman, to announce a $500,000 contribution by the Provincial Government towards Daffodil Place, a project of the Canadian Cancer Society. The provincial government announced today a donation of $500,000 towards Daffodil Place, a project of the Canadian Cancer Society that will provide accommodations for people who must travel to St. John’s for cancer treatment. The province gave $500,000 to Daffodil Place Tuesday afternoon and Peter Dawe described the donation as the "official stamp of approval." The province's donation puts the fundraising drive just past the halfway mark, to $3.6 million, noted campaign chairman John Steele. Post-Greene, of course, the provincial government will be super-quick to correct the record... right? All them provinces, running their provincial EI plans, provincial old-age pension plans, Departments of Provincial Defence, provincial coast guards, provincial fisheries and oceans departments, and so on. The provinces have all the responsibility, and the feds have all the money. During his time as Ambassador to Canada, you’d think the good Citizen-Comrade would have cracked open the Main Estimates at least once. Or maybe the Public Accounts. Or, especially, the Fiscal Reference Tables. Were he to do so, Citizen-Comrade would discover that, in fact, the federal government collects, at last count, just 43% of the public, own-source, revenues of all orders of government (federal, provincial, territorial, and local) in Canada. Of that, the federal government turns around and transfers nearly 8% of the total, and 18% of its overall revenues to – provinces, territories, and local governments. 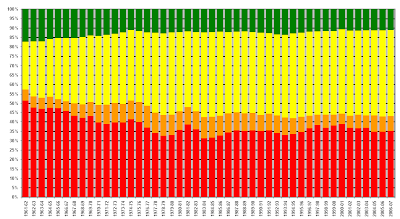 This graph (same colour scheme) shows the same data, but stacked as percentages adding up to 100%. 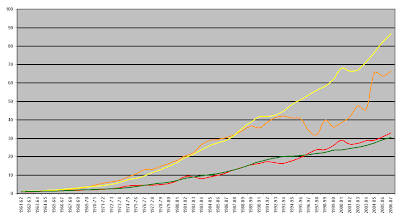 And this line-graph (same colour scheme) shows the growth rate in each of these four classes of revenue since 1961. The values for 1961 are set as 1, with subsequent years indexed to that year. 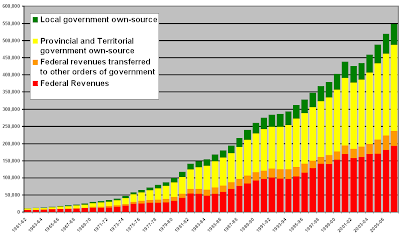 In fact, provincial and territorial government revenues have grown at a faster rate than that of that amount of federal revenues that the federal government actually keeps to itself. The second-highest rate of growth, other than during the recession and restraint period of the 1990s, has been in federal revenues transferred to other levels of government. Lagging behind both, and swapping the third-place position from time to time, are federal “kept” revenues and local government own-source revenues. John L. Noseworthy, CA, is peeved. Even if there is ample reason to doubt whether the CNLOPB falls under the ambit of that Act, you go! ...and this, despite the inconvenient fact that Parliament — the federal one — had not directly voted any such monies, or any other program which could, on the Treasury Board guidelines — do you have those quaint things, too? — furnish such funding. Is this normal budgetary practice within the Newfoundland and Labrador provincial government? Perhaps, pursuant to s.17, the AG could get to the bottom of this rather odd practice of budgeting imaginary money. Just try going to your friendly neighbourhood financial institution to cash money that doesn't actually exist, but which you are "strongly advocating" for, which you consider "an ideal opportunity"; which is a "case" that a provincial Cabinet Minister is "making"; or which you "continue to await"; or which is "subject to..., subject to..."; or which is being "articulated" and "lobbied for"; or which is a "top priority". "So, we have to use the resources we have now to change our economy," Minster Marshall said. "The oil and gas money we should use towards hydro, to provide an economy when the oil and gas is gone, because it will all be gone one day. Hopefully, it will be a long time, but it will be gone." Step 1: The oil and gas money we should use towards hydro. Step 3: Provide an economy! Yet again, it's the Underpants-Gnomey approach to the so-called development of the so-called Lower Churchill. Gus Etchegary is big on the Iceland comparisons. And he's big on "common property resources". Question: how big is Iceland on "common property resources"? We are starting to live in the lap of luxury, with all the offshore oil revenues, but still we have the highest unemployment rate in Canada. Il est luthérien, mais il aime les fleurs. Bill reads French. He should get it. What part of the Atlantic Accord don't you understand? At the moment, we have a healthy amount of oil revenue coming into provincial coffers; that money, sadly, is from a non-renewable resource, and will eventually run out. What if the province decided, instead, to talk to the federal government about diverting a segment of that oil capital away from general revenues, and into an endowment fund to significantly change the financial dynamics of attending the province's post-secondary institutions? Why would the province have "to talk to the federal government about" anything? The province, alone, with no intercession in any way, shape, or form, by the federal government, the province, the provincial government, that entity seated in St. John's, not Ottawa, the province of Newfoundland and Labrador, Telegram masthead, already collects, and always has collected, those "oil revenues", and can do, and does do, whatever it wants with them. Oh, bring back my autonomy, nomy! Oh, bring back my autonomy! We as Newfoundlanders and Labradorians aspire, not to perpetual subservience, but to self-sufficiency. Our people are not content to tolerate a future of relying on others economically. However, our people have now also learned that we will achieve self-reliance economically only by taking charge of our future as a people. To that end, My Government will harness the desire among Newfoundlanders and Labradorians to cultivate greater cultural, financial and moral autonomy vis-à-vis Ottawa... Our people are proud nationalists who believe it is only by affirming our identity as Newfoundlanders and Labradorians that we will realize our goal of economic equality within the federation. Our people are ready to take charge of our future and, under My First Minister’s leadership, our province will achieve self-reliance by becoming masters of our own house. The Labrador City town council isn't taking no for an answer. The municipality supported a letter sent to provincial Education Minister Joan Burke by the Hyron Regional Economic Development Corporation earlier this year asking for additions to the new college campus and in last week's council meeting, the town received a response. While Ms. Burke conceded the corporation made a number of strong points about the design and construction of the new Labrador West campus of the College of the North Atlantic, she didn't make any commitments. "I said at the time (of the announcement) that we need to have the infrastructure in place to support the existing needs of the Labrador West region and be prepared to respond to the future needs of a high growth region," she stated in the letter. "Government does indeed recognize that the college plays an important role in meeting labour market needs and ensuring continued economic growth and development of the region." In the letter, Minister Burke recommended the town look for other partners for a residence and gym and directed Hyron to federal funding agencies. Autonomy! one federal funding agency at a time. This year's Speech from the Throne should be a real hoot. Williams - who wrestled $2 billion dollars in extra oil revenue benefits from former prime minister Paul Martin and later a 4.9 per cent equity stake promise from the Hebron oil consortium - says it will be late 2009 before even deciding on the right approach to develop the lower Churchill River. Interesting: the timeline keeps shifting. Once upon a time, 2009 was going to be Project Sanction Year. "Well, at best that would be late 2009," said Williams. "We're going through the environmental process. We're attempting to reach agreement with the Labrador Innu. I'm optimistic that can happen. (Then we'll decide) what the nature of the project will be and get the financials in place and be ready to rock'n'roll." "I'd like to move upwards on it but I don't want to move upwards until we get some things in place. The first major hurdle would be settling the Innu land claims and the agreements and rights there. That would be the most important thing. Since then, the Quebec Innu have indicated that they may have some interest there, so you have to deal with that." Now here's an interesting bit: you have to deal with Quebec Innu claims, but not Labrador Métis Nation? Another hurdle is Ottawa. Williams would like the federal government to help, but said he's prepared to develop without federal involvement. Autonomy! Go it alone! We know what we're fighting for, and that's autonomy, one federal loan guarantee at a time. Environmental approval is another barrier on the way to the finish line. Then there's the sticky issue of how to get any power from Labrador to markets in North America. Yes, because Labrador isn't part of North America, and Brazil isn't interested. "I'm still optimistic (a deal) can happen and the target completion for that would be 2015," said Williams. "So major construction would be probably from 2010-2015." The word "deal" usually implies more than one party. With Quebec, in ODP's eyes, too "volatile", and the federal government not needed, and a smelter off the table (not that it was ever on to begin with) who is there to do a "deal" with? It's awfully hard for a one-man band to put on a rock-and-roll show. "I tell ya, DFO, Bill, there’s only one way to describe it. It’s a cesspool of misinformation." Nothing further from "nothing further from the truth"
Week Two of Operation Happy Money begins with a search-and-happify mission into Humber Valley District. Humber Valley, students of ancient political history will remember, had the temerity to vote Liberal of all things in last winter's b-election, even in the face of cabinet ministers and barely-elected PC MHAs offering up not-so-subtle hints that it wouldn't be good for their health to do so. Purely by coincidence, the amount of funding under the Provincial Roads Improvement Program announced for Humber Valley last spring — scant weeks after the Humber Valley by-election — suddenly dropped to less than half of the amount it typically got while Kathy Goudie warmed the seat on Danny's behalf. But the good people of Humber Valley had the chance to redeem themselves, and took it, voting correctly in the general election last November, just like their comrade-citizens on the Isles of Notre Dame. And just like in that perfected district, the amount of PRIP funding available to Humber Valley has whipsawed back upwards. All entirely coincidental, of course. Danny Smallwood is nothing like Joey Williams, and would never, ever, ever, use the public purse to punish or reward electoral districts for the way they vote. We must confuse our traducers! I would like to respond to Lucia Salazar's letter to the editor, headlined "Tourism ads a waste of money," Feb. 13. In the past four years, non-resident visitors to this province have increased by about 15 per cent, contributing approximately $365 million annually to the provincial coffers. The total resident and non-resident tourism industry contributes about $840 million to the provincial economy each year. Steve, boy wonder: "Provincial coffers" <> "provincial economy". Similarly, "Mount Pearl coffers" <> "Mount Pearl economy". See? And yes, the Provincialist Communists, especially, among others, are kinda hazy on the distinction. The psychological and political concatenation of the economy and the government treasury, is a large part of the reason the provincial economy has long lagged behind the rest of the country. Perhaps Mr. Kent would like to try again. "If the road doesn't come in, it won't just be us," says Tête[-à-la-Baleine] resident Martin Marcoux, who owns the local auberge. "They're going to have to move the entire Lower North Shore." In 2006, the Charest government announced $100 million over 10 years for an extension of the road to the Labrador border — by which time, people here say half-jokingly, they'll either be dead or in Alberta. [Premier Danny ]Williams said construction of a fixed link would be a 15-year project. He said it would require the participation of Quebec to build a 350-kilometre highway along the north shore of the St. Lawrence River. "Nothing happens here unless the Quebec north shore gets done," he said. "In order to make this economically feasible and viable from any perspective, (highway) 138 has to be completed." He said he will speak to Quebec Premier Jean Charest "at the appropriate time." This corner agrees: the Williams Government Memorial Tunnel makes no sense, on any level, without Route 138. And that was three years ago, today. How much longer until "the appropriate time"? Or is "volatility" still a problem? If so, on which side of the border and Gulf? By prolonging the inter-legislature break to March 10th, you will have waited 175 days since the last session to re-open the House of Assembly, breaking your own previous mark of 171 days and taking full ownership of fifth and sixth place in post-Confederation history. You now rank behind only Smallwood for the longest interval between the last sitting of one legislature, and the first of the following one. You will also beat your own previous record of a 149-day break since the election, which you set in 2003. You will now have the fourth- and fifth-sorriest post-Confederation record, and the gold and silver medals in post-Smallwood history, leaving Frank Moores' 1975 two-month mark in the dust. What on earth is "Newfoundland Labrador Liquor Corporation"? A significant two-word phrase is conspicuously missing from ScotiaBank's latest Provincial Trends. OK, so the Newfoundland Weekly Separatist, not that it cares, is the subject of regular merriment around these parts. OK, so Jamie's off the hook. The province’s Intergovernmental Affairs Minister, Tom Hedderson, says there is a slow departure of federal presence at the Canadian Forest Service centre in Corner Brook, and that it’s not going unnoticed. When the centre was announced in the mid-1990s, the full complement of staff was to be 30 but the centre has never employed that many. 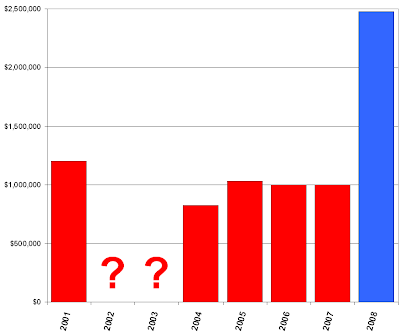 The highest staffing level was 22 around 2001, but the crew has diminished to 16 at present. Tom Hedderson says he’s struggling to keep the federal presence in this province safe from the penalty of death by a thousand cuts. The Intergovernmental Affairs minister said a slow departure of a federal presence in this province is being felt keenly in places like the Canadian Forest Service centre in Corner Brook. When the centre was announced in the mid-1990s, the full complement of staff was to be 30 but the centre has never employed that many. The highest staffing level was 22 in around 2001, but the crew has diminished to 16 at present and Hedderson says that’s not acceptable. He said the number of federal employees in this province has dropped by 25 per cent in the last 10 years or so. My boss can vote for who he wishes. He can mark his 'X' where he wishes to mark it. From my perspective, I have a job to do. I'm elected by the people of St. John's Centre. I'm in cabinet representing the people of the province of Newfoundland and Labrador and I have a job to do. And I'm going to do that to the best of my ability. If and when there is a federal election, we all as individual citizens can make up our own minds what we want to do. I'm here today as a provincial minister and I'm carrying out my duties as a provincial minister. Shawn Skinner, minister of human resources, labour and employment for the province, told the St. John's Board of Trade Wednesday to be wary of federal politicians bearing funds. He said the Harper government has broken promises to the province before, referring specifically to an equalization promise that the province says is worth $10 billion. "We're seeing some promises again now, we're seeing some more money coming," he said, referring to recent announcements by the federal government. "Why are they doing this? I think the answer is simple. Voting time is here again. And if that's the case, let's be careful where we mark our X." Vote early, vote often, vote carefully. 708 million pieces of pork from the B.S. ministry. That's what the Atlantic federal Liberal caucus called its latest tax dollar BBQ. In the immortal words of Trailer Park Supervisor Jim Lahey, "Looks like we're in the middle of a sh*t typhoon so we'd better haul in the jib before it gets covered in sh*t"
Too late. It's flying fast and furious. The Atlantic federal Liberal caucus is once again doing what it does best -- it's selling out. When Atlantic premiers have called for greater say over fisheries resource management, this federal Liberal caucus turned against Atlantic Canada. When Atlantic premiers have called for fairer deals on offshore non renewable resource revenue, this caucus scolded them for demanding more. When Atlantic Canadians want a federal government that defends the resources off our shores, the federal Liberals instead respond with pork. Yet when it comes time to hop aboard the ACOA parade wagon and start sprinkling goodies, they're out in full force. And here's someone called Liam O, today, on the VOCM QoD comments board. Maybe not the same person, but this Liam O, like Liam O'Brien, is constantly on the hunt for "bias", likes things that are "genuine", is fond of the "unprecedented", doesn't like to see anyone "belittle" anything. This Liam O, like the Liam with a full last name, remains totally unmoved by the State-mandated ABC movement, and even manages to distinguish Evil Dirty Librils with their "tax-dollar BBQs" of "pork" (mmmm... ribs) who "sprinkle goodies", from those meriTorious Conservatives who are genuine responders, socially responsible, and compassionate. Kinda in the same way that Danny can distinguish between "recycling" and "re-hashing" funding announcements on the one hand, and "informing The People" on the other. Comments: This is a bit of a biased way of phrasing the question. I'll admit I voted "yes" because the present federal government has provided unprecedented levels of funding in response to the the needs, demands and requests of various community groups in our province. Still, each person will have to view this according to their own view of the significance of the specific issues and announcements. No government before has done as much in such a short period of time. But it's not about a "spending spree," it seems to me like a much more genuine response to genuine and specific needs: Everything from the announcement of funding for improvements to bridges and trestles to Small Craft Harbour projects to language training and job search support for immigrants to projects to help senior citizens in dozens of Newfoundland and Labrador communities to money for Atlantic Salmon research to the Trans Labrador Highway amounts to truly needed and deserved infrastructure and socially responsible and compassionate attention to issues raised by people right here in rural Newfoundland and Labrador. The people of this province will decide on their own which issues matter the most for them; but regardless of what happens in any election, lets not belittle the importance of some of these far more constructive and viable projects and announcements for the communities affected. Once again, the Tories feel that they are entitled to make up "facts". No one — well, almost no one — called the lying liars out on that lie. In the "last ten years" for which statistics (StatsCan Table 183-0002) are available, between March 1997 and March 2007, the number of federal employees in Newfoundland and Labrador dropped by 6.5%. 6.5%, in case Hedderson isn't quite clear on the mathematical principles involved, is less than 25%. Of course, this "drop" is, in part, the result of Hedderson being permitted to choose his own data set. If he's allowed to do that.... then so is anyone. So, how about this statistic, which, unlike Hedderson's and Danny's, isn't made up: between January 2002 and March 2007, the number of federal civil servants in Newfoundland and Labrador increased by 13%, from 6,500 to 7,350. 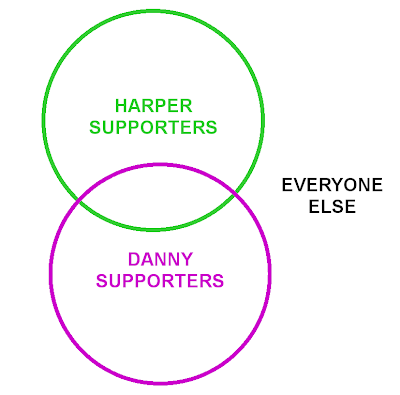 Remember, Cliff, Jamie, just because Danny or one of Danny's Minions says it, doesn't mean it's true. The official explanation is as follows, right? The Province is not referred to as Newfoundland Labrador. The two words only appear together with the stylized Pitcher Plant as a single image which is the Province's trade mark for advertising and marketing purposes. Never mind that on provincial documents like these, the province is clearly, and inaccurately, and sycophantically, referred to as "Newfoundland Labrador", like He prefers. So, McBay, Bowring, Skiiiiinner!, what's up with this? Residents in the Cashin-Froude area of St. John’s can look forward to a major transformation in their community over the next six years. The Province will contribute $4.2 million to makeover one of Newfoundland Labrador Housing’s (Housing) oldest residential neighbourhoods. The $4.2 million funding for this project will come from Newfoundland Labrador Housing’s annual budget, and represents 70 per cent of the total $6 million project cost. The Honourable Shawn Skinner, Minister Responsible for Housing and Human Resources, Labour and Employment, made the announcement today. What on earth is a "Newfoundland Labrador Housing"? Bear in mind, McBay, that "The Province is not referred to as Newfoundland Labrador. The two words only appear together with the stylized Pitcher Plant as a single image which is the Province's trade mark for advertising and marketing purposes." Bear in mind, as well, that the Housing Corporation Act — y'know, an inconvenient little thing like a statutory law, something Great Lawyers™ will be familiar with — makes it very clear that the corporation is the Newfoundland and Labrador Housing Corporation. Conjunction included. Premier Danny Williams is confident Paul Martin's Liberals will soon make a public announcement on potential increased oil revenues for the province. But now that the federal election is underway, Williams is giving a deadline for when he expects to hear some news. "We certainly can't go beyond two weeks on this," the premier said. "I have to give it a fortnight, to give it a reasonable period of time." [Finance Minister press secretary Pat] Breton said they hope to have an agreement in place by Oct. 26, when the first ministers meet in Ottawa to discuss the federal equalization program. Williams insists that a deal will be in place by then. "That's the deadline. It has to happen before the 26th," Williams said Friday. The province had originally hoped a new accord would be in place by the end of summer. "There are no stumbling blocks (in the way of a deal), because I have a firm commitment from the prime minister of the country, and I insisted on that commitment ... so that's the deadline," Williams said. "It has to happen before (Oct.) 26." ...you know, we had a deal, we have an agreement which is very clear, very unconditional, very unequivocal. You know, there's no misunderstanding on it. And when we did not receive our commitment from the Government of Canada by the deadline which was imposed, which was prior to the equalization meeting on the 26th, then I felt that there was no other alternative. Newfoundland Premier Danny Williams gave Prime Minister Paul Martin one week to cave-in on a new oil and gas revenue deal yesterday as he agreed to return to the bargaining table. "We mutually agreed that this matter is going to be resolved before Christmas - that was agreed by the feds and by both provinces," Premier Danny Williams told The Telegram Thursday. "We're a week away from the close of business before Christmas, so time is drawing very, very tight," Williams told reporters Thursday. "I won't allow us as a province to be just jammed on a deadline, quite frankly. "We will know over the course of the next week whether this is going to be on or off, whether, the term was used, we fail it or we nail it." Ooooooh — with a "quite frankly" and a rhyming couple, you just knew Danny meant business. "Premier Williams has been pretty firm on the Christmas deadline, and Wednesday is pretty much as close to Christmas as we're going to get." You know, there's not going to be a firm date because I've now been accused of setting deadlines. Every time there's a deadline to meet, which has been set by the federal government, I get accused of setting the deadlines. And that was just Equalization War One. Talks on the possible development of the Hebron-Ben Nevis oilfield will end by early April, according to reports in the national press. Premier Danny Williams told the Globe and Mail in a story published Saturday that the province and the Hebron consortium agreed to that deadline two weeks ago. Williams told the Globe the oil companies wanted to "bring it to a head quickly." The premier indicated he is willing to work within that time frame. Harbour Breton decided Wednesday the Barry Group should operate the former Fishery Products International fish plant. Earlier Wednesday, Premier Danny Williams said he wanted a decision by the end of the day from the town about who they wanted to run the plant, and that the cabinet would likely approve the decision the town made. Federal and provincial politicians have set a deadline for making decisions expected to restructure Newfoundland and Labrador's bruised fishing industry. Five Newfoundland politicians implicated in a spending scandal have until Monday to begin repaying $1.6 million in constituency allowance overpayments or risk facing legal reprisals, the province's finance minister warned Friday. If they don't refund the money or make satisfactory arrangements for repayment by then, the province will seek judicial enforcement to collect the money, Tom Marshall said in an interview. "We've issued the demand letters," he said. "We've asked for the money to be paid back. We've indicated that we're prepared to consider reasonable terms of repayment." "If not, we'll take it to the next level." Ten months after becoming Newfoundland's premier, millionaire Danny Williams has yet to complete steps that were recommended to avoid conflicts between his substantial business holdings and his role as the province's top decision maker. Williams, a self-made millionaire, has interests in the offshore oil industry, telecommunications and tourism. Wayne Green, the provincial commissioner of members' interests, originally hoped his recommendations could be in place by mid-March. A second July deadline has also come and gone. 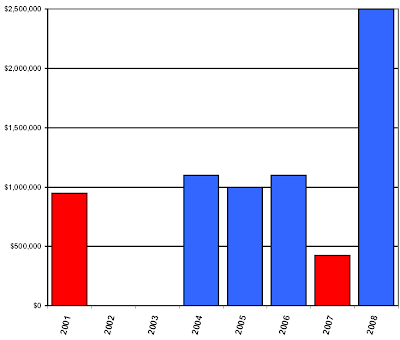 Submitted for your consideration: this graph shows the amount of Provincial Roads Improvement Program funding allocated since 2001 in the districts (Twillingate-Fogo until 2007; Isles of Notre Dame since the election) which Gerry Reid formerly represented, and in which he sought, and failed to obtain, re-election last fall. Note that, for the first four years of the Williams Era, during which the district was in opposition hands, PRIP funding in Twillingate-Fogo averaged just under $1-million. Indeed, for two years, the allocation was a million on the nose. And now that the district has had the eminently good sense to vote correctly? "Nothing further from the truth." "But to come in and double- and triple-announce money, that's giving the appearance of being new money, that's misleading," Williams said. Premier Danny Williams says his cabinet ministers are not in the habit of announcing old money. A $3-million carryover. Or, if you prefer, "old money." And the "infrastructure program" was valued at $2-billion. It is only valued at $2-billion now, if you count money that's already spent. Or, if you prefer, "old money". It's always impressive, the ability of Our Dear Premier to project his own character failings, and his own worst habits, onto his political enemies; and to take his supposed virtues and turn them into their vices. The Provincial Government launched its record-setting 2008-09 Provincial Roads Improvement Program today, allotting $2.475 million for projects in The Isles of Notre Dame region. The Honourable Dianne Whalen, Minister of Transportation and Works, made the announcement, as part of this year’s $73 million strategy to improve provincial roads. "This government recognizes the correlation between infrastructure investment and economic growth, which is one of the main reasons we are making unprecedented investments in our province’s roads, particularly in rural parts of the province," said Minister Whalen. "We anticipate this year’s funding will create over 1,400 person years of employment." In addition to the $73 million in new funding, approximately $3 million will be carried over from last year’s Provincial Roads Improvement Program. These road improvements are part of the Provincial Government’s infrastructure strategy, valued at over $2 billion. Complete paving Route 335-14, Change Islands Road. Derrick Dalley, MHA for The Isles of Notre Dame, said: "I am extremely pleased with this significant investment. In addition to providing a more pleasurable and comfortable travelling experience for residents and tourists alike, these projects will have a positive impact on the area's economy." 2008 02 20 9:25 a.m.
Is this what Jerome signed up for? It’s hard to tell what was most laughable about his appearance on Backtalk this afternoon. Was it the fumbling and stumbling to remember to add “, and Labrador,” after “Newfoundland”, complete with audibule punctuation? Was it being turned into an audibly not-very-enthusiastic shill for the Blame Canada theme that is being pumped out of the Eighth Floor at record volume of late? Was it the awkward engagement in the ABC campaign, and the not-overly-subtle attempts to backtrack once engaged in it? Was it the masterful, lawyerly success in answering the questions he wished he’d been asked, and not the questions he was actually asked? All hilarious, to be sure. But perhaps not as hilarious as Minister Kennedy’s adoption of one of the basic, founding, tenets of Dannyism: that history begins with Danny. Well, Bill, what I’m looking at right here now, what letter is dated May 18, 2006, March 8, 2006, January 30, 2007, a letter from Minister Joan Burke dated…. May 2007, when I’m looking at letters at that, and I know that my Assistant Deputy Ministers for Corrections and Policing has been in contact with his Ottawa counterpart as of two weeks ago, emailed them, and they emailed him back, it seems to me that Minister Hearn is certainly out of the loop. In fact, up to several weeks ago, my Assistant Deputy Minister had sent an email to the people in Ottawa, and were waiting to hear back from Ottawa. My concern, quite frankly, is that this is not as legitimate a proposal as it seems, but it’s an election ploy. An election ploy? Playing penal prison and penitentiary politics? One of the oldest tricks in the recent Newfoundland political playbook? SAY IT ISN’T SO, JEROME! ST. JOHN'S -- ST. JOHN'S (CP) - A proposed penitentiary at Windsor, Newfoundland, announced by a Liberal MP during the federal election campaign, may not be built, Justice Minister John Crosbie says. Mr. Crosbie told a news conference the Aug. 6 announcement by William Rompkey, then minister of transport, was premature. No agreement exists between the federal and provincial governments for the prison and the federal Treasury Board did not approve construction, he said. ST. JOHN'S, Nfld. (CP) January 14, 1987 - A $26-million federal prison that was to be built in Newfoundland was aborted because Prime Minister Brian Mulroney decided to give a costly patronage plum to his own riding in Quebec, provincial politicians have charged. "The Mulroney Port-Cartier penitentiary set us back... because of the extra cost associated with putting it there, instead of the location recommended by the government officials," said Newfoundland Attorney General Lynn Verge. "What I was told by (federal Solicitor General James) Kelleher was that there was a moratorium on construction in the aftermath of Port-Cartier." Documents obtained by the weekly St. John's Express through the Access to Information Act show that in 1985 Mulroney's Conservative government had planned to build a minimum-medium security prison in Newfoundland. The 160-cell institution was approved by Correctional Services and the plan was submitted to the Treasury Board for final approval. But in June 1985, the prime minister announced he was changing the site of the new Quebec penitentiary from Drummondville to Port-Cartier, in his Manicouagan riding. Building the prison there cost an additional $41 million, for a total of $68 million. The federal government decided to halt all construction and renovation of prisons almost two months before the exempted Port-Cartier prison was announced. Verge said both the provincial government and then federal justice minister John Crosbie, the province's representative in cabinet, had agreed the central Newfoundland town of Buchans was an acceptable site for the new prison, which would have created about 100 permanent jobs. One in four workers there is looking for work. Bill Rompkey, the Liberal MP for Buchans, says Port-Cartier definitely killed funds for the Newfoundland prison. The 1985-86 financial estimates for Correctional Services showed that Treasury Board had approved $6.9 million for the Newfoundland prison project. But in the 1986-87 estimates, there is no mention of any funds for the prison. However an optimistic Mayor Power said: "Mr. Crosbie tells me that there will certainly be a penitentiary announced for Newfoundland before the next election call." BUCHANS, Nfld. _ Not many communities would be eager to live with a federal penitentiary, but for Buchans, it's either that or extinction. ''If we don't get it, I'm doubtful as to the future viability of this community,'' says Sean Power, the energetic young mayor of this former mining town in central Newfoundland. The community expects to know in a few weeks whether it will be chosen as the site for the proposed prison. However, International Trade Minister John Crosbie, Newfoundland's representative in the federal cabinet, has refused to say when the decision will be made. OTTAWA (CP) August 24, 1988 - Trade Minister John Crosbie will announce today that a $29.6-million federal penitentiary will be built in Newfoundland, sources say. Crosbie has scheduled a news conference in St. John's, where it is expected he will announce construction of the prison at Carbonear, in the eastern Bonavista-Trinity-Conception riding held by Progressive Conservative MP Morrissey Johnson. But sources say the government will build the new prison at Carbonear, on Conception Bay about 50 kilometres northwest of St. John's. The prison will replace an aging penitentiary in St. John's. George Sweeney, Liberal MHA for the District of Carbonear-Harbour Grace, says recent reports on the inadequacy of Her Majesty's Penitentiary in St. John?s should lead to the phasing out of that facility and the construction of a new structure at the previously proposed site for a federal penitentiary identified in Harbour Grace. "There is growing evidence that Her Majesty's Penitentiary is no longer meeting the needs of the justice system in the province and alternative options should now be explored," said Sweeney. "The Town of Harbour Grace was identified by the federal government in the late 1980s as a site for a penitentiary that was expected to be built and opened in 1993. The project was later cancelled, but the site remains a viable location for such a facility. As these contracts are let, then we notify the people in the communities that they’re let, so there is a double process there. But it’s not about getting a second bang for the buck on these things, as a matter of fact, it’s about informing people early, and then once the contracts are awarded, it’s letting them know after. But to come in and, y’know, double- and triple-announce money that, that’s given the appearance of being new money, that’s just, that’s misleading. Not about getting a second bang for the buck. Or a third. Or a fourth. Or several dozen bangs, over the course of half an election year. Like, totally not about that at all. A Great Lawyer™ will of course be familiar with the phrase “a distinction without a difference”. Students of local politics will remember the Smallwood Rule of Public Relations: First, Announce That You Are Going To Announce Something. St. John’s Mayor Andy Wells says he plans to use the extra money he’ll be earning from his second job to help pay his legal bills. Wells is facing hefty legal costs estimated at about $100,000 as a result of losing an appeal in a defamation case against former city councillor Paul Sears. Last November, he told The Telegram he had already paid about $45,000 of his own costs, and $14,000 to the other side. On Thursday, Wells said the two incomes he’ll be receiving once he becomes chairman and CEO of the Public Utilities Board (PUB) March 1 will help him pay the rest. “I’ve got some serious legal bills that I’ve got to pay, arising from my performance in my duty as mayor, which is not my fault,” he said. “Whatever extra money I get is going to go towards the paying of those legal bills. Wells told St. John's city council's regular meeting on Monday evening that he will leave office by a very precise time: no later than 9 a.m. on the morning of Monday, March 3. A minute later that morning, Wells will assume duties as the chair and chief executive officer of Newfoundland and Labrador's Public Utilities Board. Wells said he wanted to stay on until March 3 so that he would remain eligible for life insurance through the weekend leading up to the start of his PUB appointment. Well(s) done, good and faithful (public) servant! We don’t have enough scientific information of our own. We always depend on the federal scientific information, and what they have, and how much they want to give us to go look. I think as a province, and I’ve said it time and time again, that we need to be putting money into science, and we are going to do that. I’d love to see us also get our own vessel. I was in Iceland about six or eight months ago, and they have their own vessels up there, they go through their own research, and they make their decisions based on those findings. So if we could get our own research done, and tie the scientists to the fishermen, and the fishermen got the bulk of the knowledge, then I think we are going to be in an informed position to make informed decisions. I don’t like relying on other information or for me to make decisions, I like to get my own information and then make a decision on that basis, so that’s what I’m hoping to do. Quite frankly, I am not satisfied to depend only on the science provided to us by the federal government. We need the people of this province to have our own research and scientific data and fish harvesting must be a part of it. We are putting our money where our mouth is - unlike the federal government - because we believe in the fishery in this province. Proud, strong, determined. Moral autonomy. Go it alone. One nation. Masters of our own house. And so today we learn, "Provincial Government (What? Not "Williams Government"?) Moving Forward With Coastal and Ocean Management". And what's this, now? The project involved western and southern regions of Newfoundland and Labrador was completed throughout 2007 and is the result of a collaborative effort between the Government of Newfoundland and Labrador and the Government of Canada. Both governments shared in the $51,000 cost of the project, with the Federal Government contributing $41,000 and the Provincial Government contributing $10,000. The Provincial Government is moving forward with the second issues scan and will fund all costs associated with the $75,000 project. Kosovo: The Bloc Québécois pronounces itself. So does the Parti Québécois. But the Federation of Newfoundland Separatists maintains its silence. Stop talking about our incompetence and go back to blaming Canada! ... "how moronic can you get." They’re using their jurisdiction over inland waters, and navigable rivers, and so on to uh, ahhhhhhhnnnnnnn, get in an area that they’re really not concerned with, hence Mike, an earlier caller, mentioned about, y’know, Transport Canada concerned about blocks of concrete falling off a trestle and hitting some guy on a boat, in the middle of the winter, on the head. It does seem to be stretching things a little tiny bit, doesn’t it? Speaking of stretching things... this is stretching the anti-federalist nonsense just a little bit, isn’t it? The provincial government acknowledged today that it does not conduct regular inspections of structures on the Newfoundland T’Railway. Last week, the province announced the closure of every bridge and trestle on the 900-kilometre-long T’Railway, citing a Transport Canada safety report. Environment Minister Charlene Johnson said today the province does not conduct routine safety assessments of structures on the T’Railway, which is a provincial park. “There’s no regular inspections, no,” Johnson said in response to questions from reporters. When he opened his 2003 campaign headquarters, Danny Williams promised to "tear down the overpass mentality". Now we see the real plan; who needs to tear the overpass down, when you can just let it fall down? After all, it worked in Quebec, and look at how autonomous they are. Despite strong words from the minister of Labrador Affairs on the lack of federal action expanding the military presence at 5 Wing Goose Bay, the mayor of Happy Valley-Goose Bay said he's content that promises will be fulfilled soon. John Hickey, MHA for Lake Melville and Minister of Labrador Affairs, said in a news release Friday that it was unacceptable for the federal government not to have fulfilled commitments to place personnel at the military facility. He listed promises for a 650-man rapid action army battalion and an unstaffed aerial vehicle squadron among things not carried out. Last year, the Eighth-ordained stock-words and -phrases were — let's see if we can get this right — "negativ(ity)", "innuendo", "personal attacks", and "non-constructive". It's all about the disdain. A milestone of sorts passed by un-noticed on Tuesday the 12th. Danny Williams overtook two previous marks by Smallwood and Moores, to take sole ownership of second place among Premiers, now having the second-worst Confederation-era record for not opening the House of Assembly after an election. This table shows the opening date of the first session of each legislature, the prorogation or dissolution date of the previous one, and the interval, in days, between the two, since 1949. In the post-Smallwood era, only Frank Moores in 1975 kept the House closed for more than two months after an election. On March 6th, Danny 46 will overtake the previous mark set by Danny 45 in 2004. All these decisions and everything has to go through Ottawa, and I don’t mean to be unkind but they know about as much about the fishery as you and I know about the backside of the moon. In Iceland where the fishery thrives, or at least thrives compared to here, they make decisions on the spot about their own destiny, and that’s the basic difference right there. As previously noted, the National Government of National of Dannystan is more concentrated in Andygrad than Occupying Government of Canada is in Ottawa-Gatineau. As for "making decisions on the spot" about one's own destiny, again, at least as calculated on the Blue Pages Method, which I'll readily abandon if Open and Accountable Government of Williams would publish detailed and reliable figures as to the geographical distribution of provincial government employment, Labrador, with about 5.6% of the provincial population, has under 4.0% of the provincial civil service. And Labrador, which at last count contributes close on 100% of the non-petroleum mineral output of Newfoundland and Somethingoranother, has less than 10% of the Natural Resources department. Is that, to use Tom Hedderson's word, "enough"? And when it comes to decisions about destinies, is the difference in how Newfoundland nationalists demand to be treated within Canada, and what they offer towards Labrador, basic enough for Ambassador Rowe? Of course, such an argument really does nothing to mitigate the inherent political and personal problem that a Premier, with a growing reputation for being arrogant and considering himself everyone else's rules, and whose government is trying to convince the rest of Canada to adopt the same cellphone law, is faced with. So what if Gordon Campbell did something worse? It doesn't make what Danny did any better. And that argument — that poor Danny is getting a worse ride than Gordon Campbell — would still be flawed even if it were true, which it is not. and you get 2170 hits — and that's without accounting for duplicates such as wire stories which appeared more or less simultaneously in multiple news outlets. And yes, this is over the same 22-day span of time following Campbell's Hawaii arrest being made public on January 10, 2003. So, if you're keeping track, Liz, you'll note that Gordon Campbell, and quite rightfully so, got 32 times the media saturation Danny did, and a mug-shot to boot. Conversely, Danny Williams, quite rightfully, got just 1/32 — a half of a half of a half of a half of a half — of the degree of media humiliation that Campbell did in the first three weeks of his driving scandal. How exactly could you miss it? This corner won't pretend to know what the answer is. Premier Danny Williams says he won't be getting involved in the political fuss over whether Andy Wells can do two jobs. Liberal Leader Yvonne Jones has joined the chorus, calling on the Premier to step into the controversy. Wells plans to stay on as mayor of St. John's, when he takes on the job as chairman of the Public Utilities Board next month. Jones says the PUB will not be able to properly handle hearings and issues that may have to do with the capital city without tainting the process. Williams points out other mayors and councilors have other jobs, citing Mount Pearl's Randy Simms as an example. Williams says Simms is Mayor of Mount Pearl, but also host of VOCM Open Line, a political commentator, and a newspaper columnist. — as if Premier Danny Williams had nothing to do with the creation of said "fuss" in the first place. Premier Danny Williams is confident in Andy Wells taking on his new role as CEO of the Public Utilities Board. Williams says he has no concerns with possible conflicts between Wells role as Mayor, and his role with the PUB. Andy Wells isn't saying what he will do in light of what amounts to an ultimatum from the premier. Danny Williams announced today that Wells will not take over the Public Utilities Board while he is still mayor of St.John 's. Wells has said all along that he intends to stay on as mayor even after March 1st, the date he was to become CEO of the PUB. Premier Williams has told Wells that he will assume the top job at the board after he steps down as mayor. The premier also notes that he anticipates that happening sooner rather than later, but Wells isn't saying. Opposition Leader Yvonne Jones says the Premier made the right decision. Jones says while she does not support the appointment of Wells to the PUB, she is pleased with Williams' move. Jones says a significant number of people are still dissatisfied with Wells taking on the job, and she's not sure if today's announcement will address those concerns. Danny's climb-down is half the story. After nearly a month of being so, well, Danny-y, the sudden-ness of said climb-down. VOCM, February 5th: Should the premier ask Andy Wells to step down as mayor to focus on his new job as chair and CEO of the PUB? Look at the "vote"-count: someone tried, hard, to skew the VOCM poll (again).